Using images like the one presented here, Cassini imaging scientists have made a major finding about the mechanism powering the general circulation of Saturn. The image shows small-scale, sheared-out cloud features associated with turbulent eddies in the vicinity of one of Saturn's eastward flowing jet streams, or "jets." The jet itself, located at 27.5 degrees south latitude, is indicated by the large horizontal arrow. Winds in this jet have blown continuously at speeds close to 320 kilometers per hour (200 miles per hour) for as long as scientists have observed Saturn. By tracking the movements of these cloud features in successive images separated by about 10 hours (about one Saturn rotation), Cassini scientists have confirmed that the eddies on either side of the jet give up their energy and momentum to help keep the winds in the jet blowing. The tilted arrows indicate the direction in which the eddies move the energy and momentum that power the jet. The winds that accomplish this are so strong that they combine to stretch out the eddies into bright, tilted streaks that are visible here, parallel to the arrows. 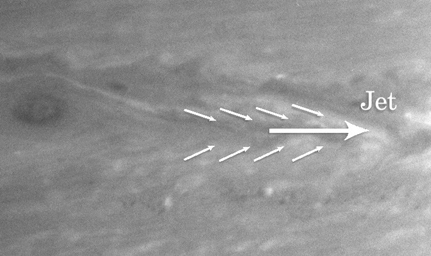 The analysis of Cassini images covering most of Saturn's southern hemisphere suggests that similar processes occurring all over Saturn explain the remarkable decades-long stability of its alternating pattern of eastward and westward jets. The same process also occurs on Jupiter, and on Earth in the storm track along the east coast of the United States. Prior to this discovery, it was thought that the jets on Saturn and Jupiter were powered by an entirely different process, analogous to the tropical circulation on Earth. But now it appears that a comparison to the atmospheric motions in the Earth's mid-latitudes is more appropriate. The eddies seen in this image also create circulation patterns of upward and downward motion (in altitude) at different latitudes that help explain the general banded structure of global cloud patterns on the Jovian planets. The image was taken using a spectral filter sensitive to wavelengths of infrared light centered at 750 nanometers. 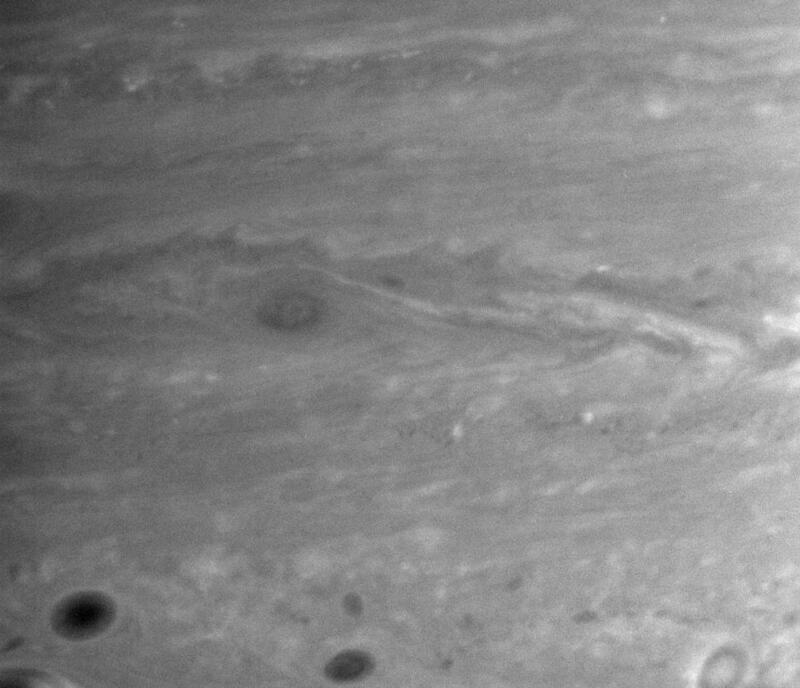 The view was acquired with the Cassini spacecraft narrow-angle camera on Feb. 5, 2005, at a distance of approximately 3.4 million kilometers (2.1 million miles) from Saturn. Image scale is 20 kilometers (12 miles) per pixel.